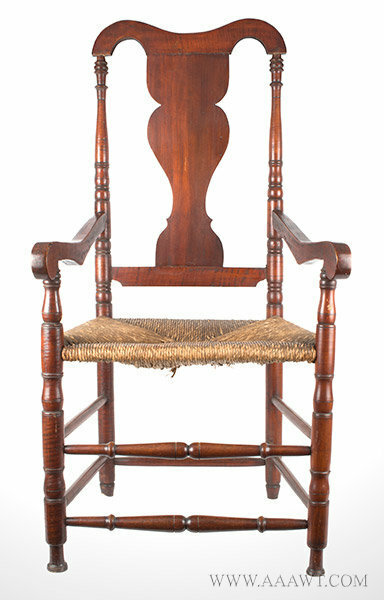 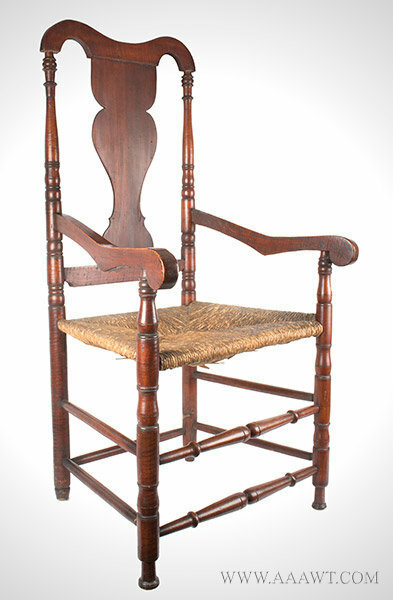 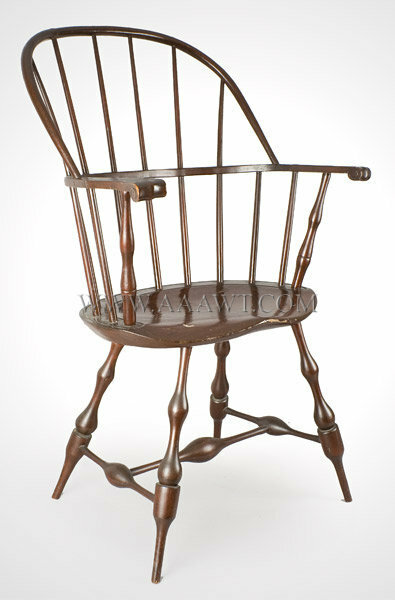 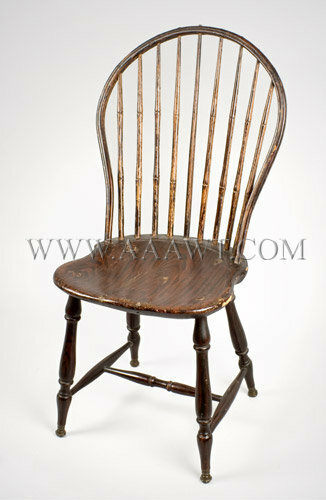 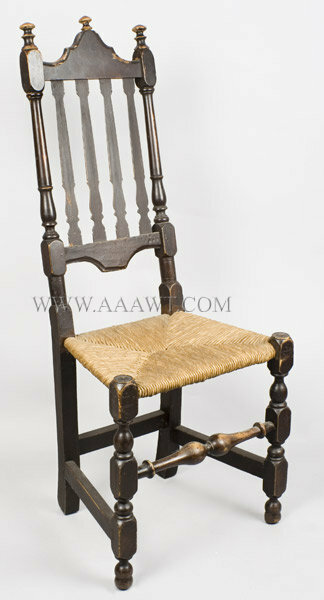 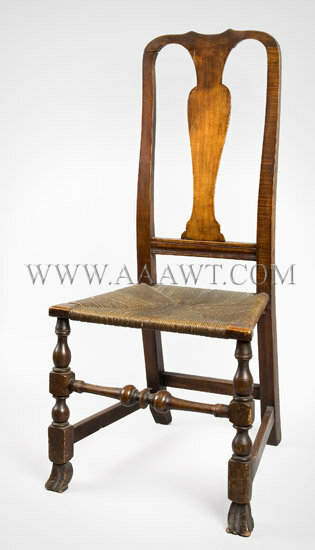 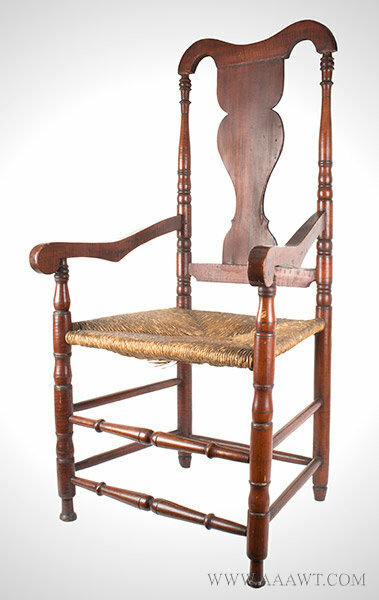 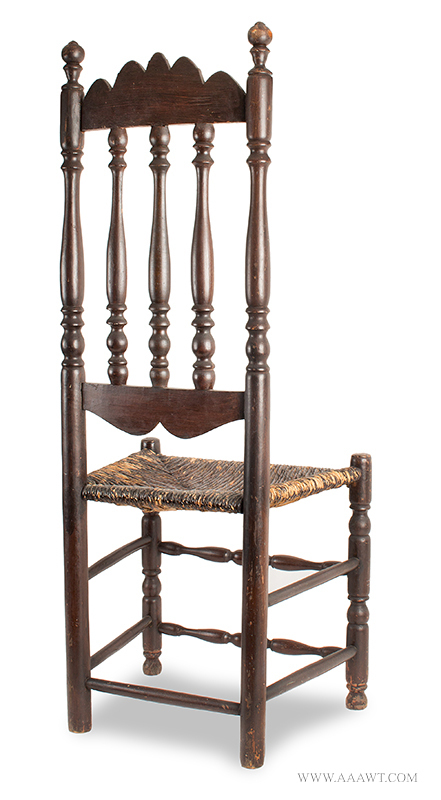 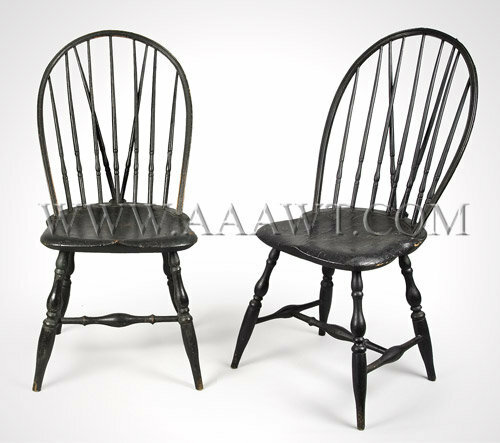 A vigorous chair of generous size featuring robust sausage-turned rear posts with bold finials joining five arched slats; blade arms under which are turned stretchers joining front posts. 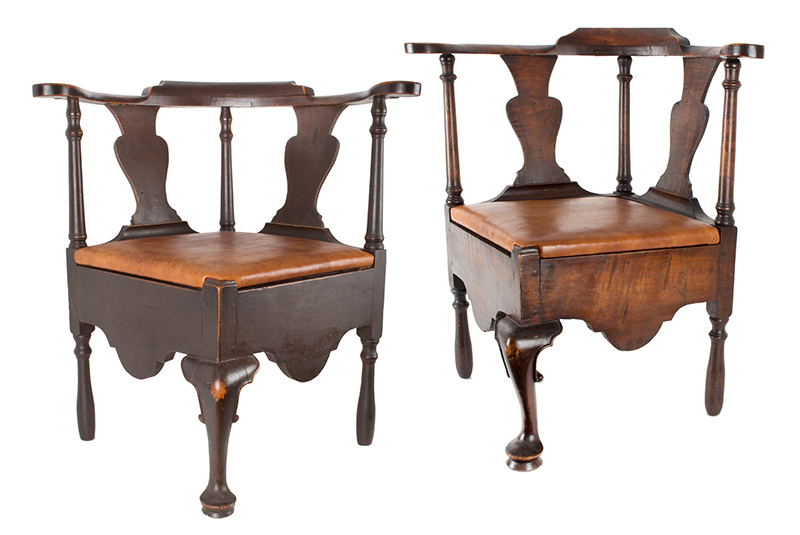 The legs display some loss of height and are joined by a double tier of box stretchers; the front sausage turned. 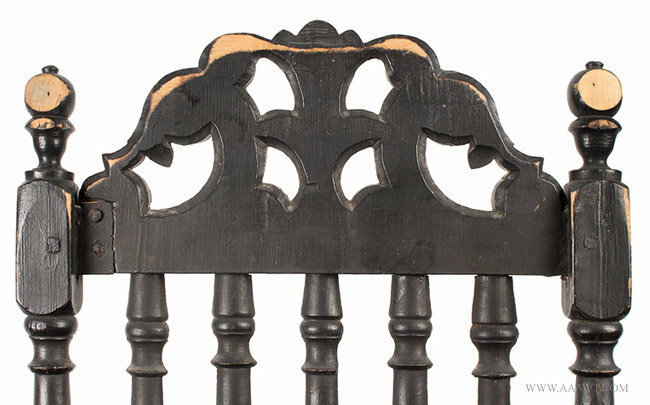 The surface is quite wonderful. 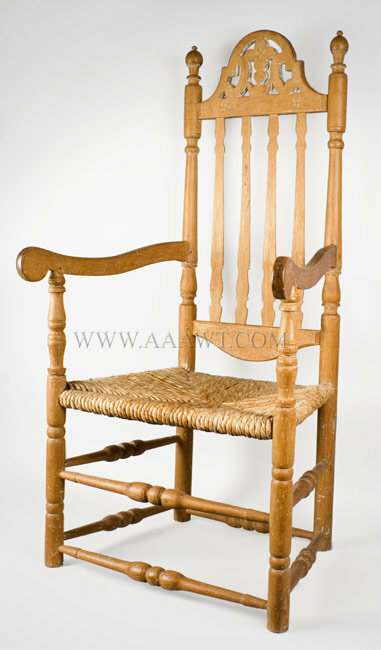 The three arched slats join turned posts featuring tall robust finials; turned arms on capped turned front posts continuing to slightly-tapering feet; the legs joined by the trapezoidal splint split seat and turned double box-stretchers. 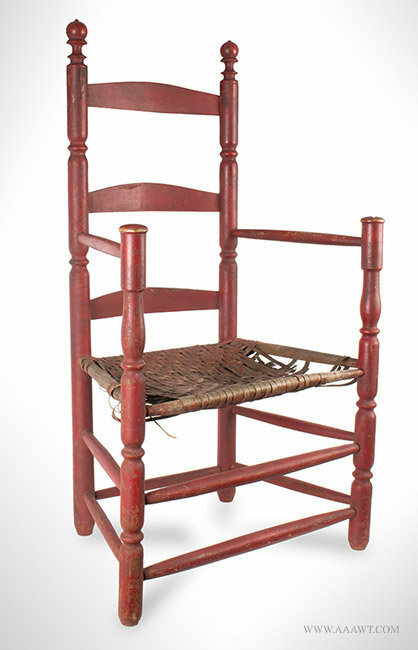 Wonderful old red paint. 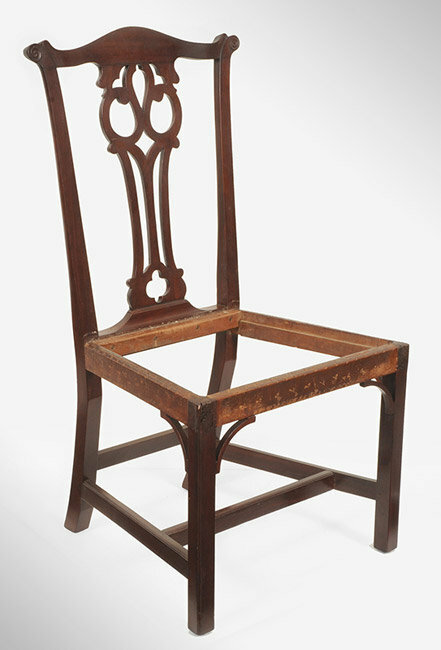 The chair is of an exceptionally grand scale and features an accentuated serpentine form crest rail, a vasiform back splat flanked by baluster-turned stiles; geometrically shaped arms terminating in scrolled grips, a trapezoidal rush seat, and baluster-turned front legs joined by double turned stretchers. 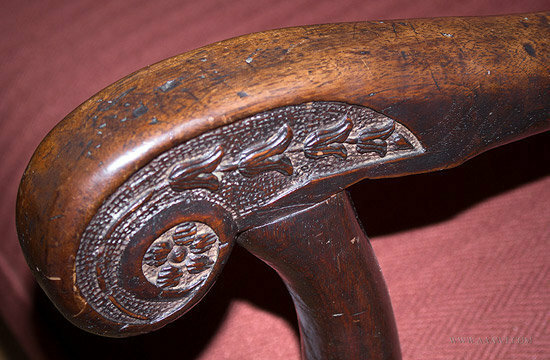 Elliptical pommel finials above slightly graduated arched slats having chamfered top front edges; old tape seat; turned posts joined by stretchers; rear legs with tilters. 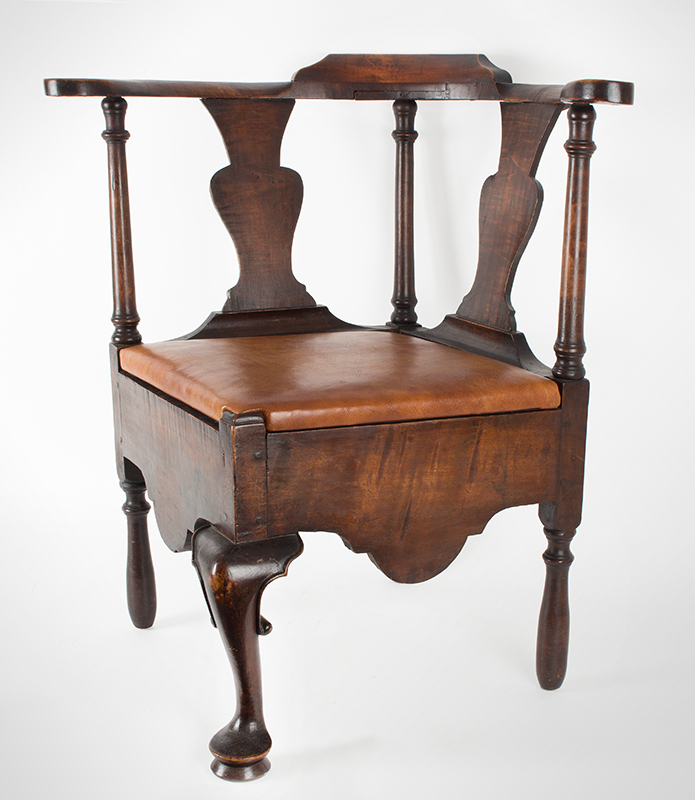 Featuring serpentine crest with upturned ears above five cylindrical spindles; curved mid-rail with paddle-form writing tablet and outwardly scrolled handhold above an original drawer raised on baluster and reel turned supports; swelled spindles above shaped saddle seat displaying two crisp maker's brands; the whole on raked baluster turned legs joined by bulbous turned H-stretcher. 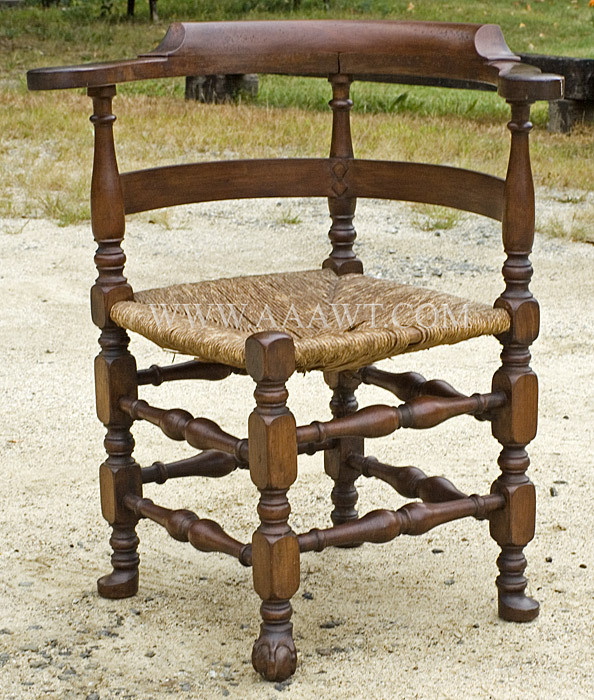 Old refinish, underside retains original green paint, second drawer under paddle and third drawer under seat missing. 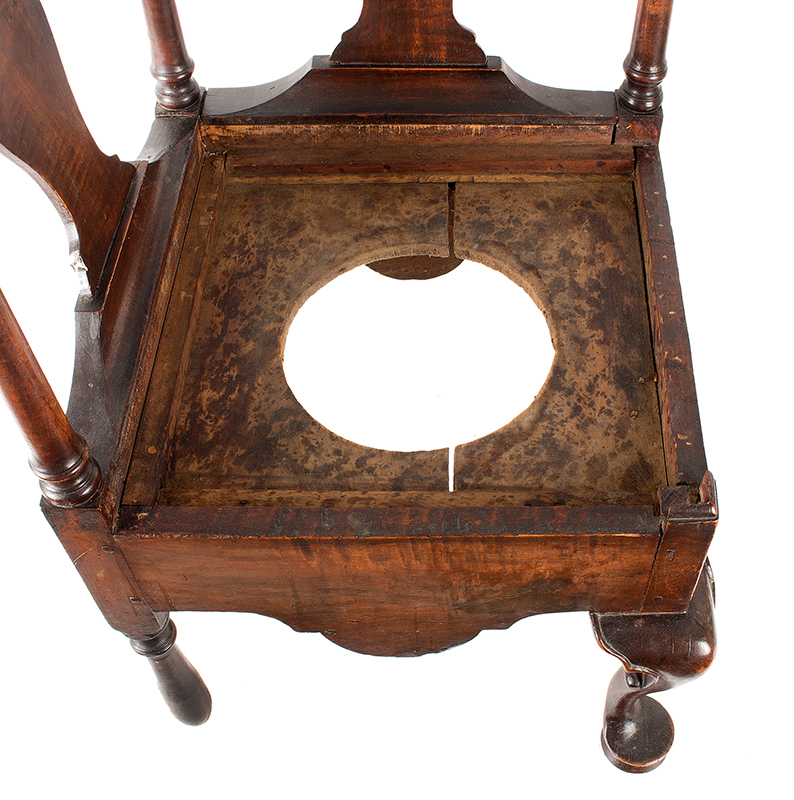 The paddle fitted with shallow well to hold inkwell during working life, else very good. 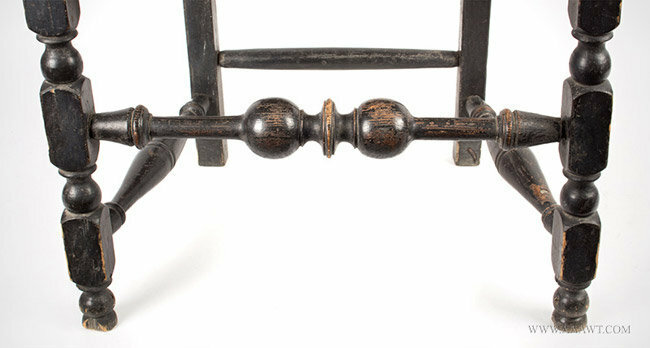 Yoke carved crest rail on raking molded-stiles centering vasiform splat above rush seat raised on bloc, vase, and ring-turned legs joined by stretchers; resting in Spanish feet. 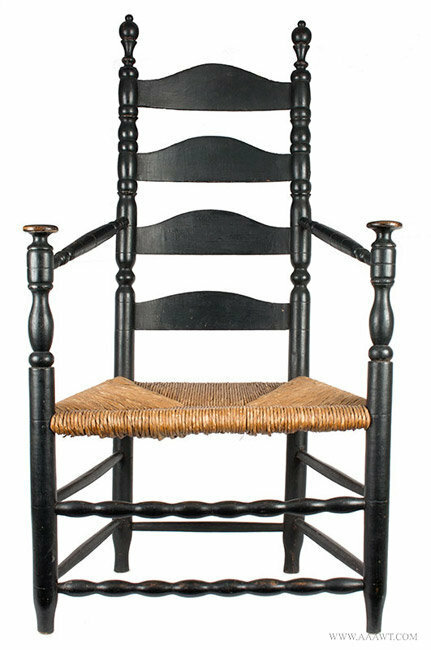 (Generally very good, minor imperfections consistent with age; crack to one corner-block, some fill to blocks, and the addition of a dowel through the back post to side seat-rail. 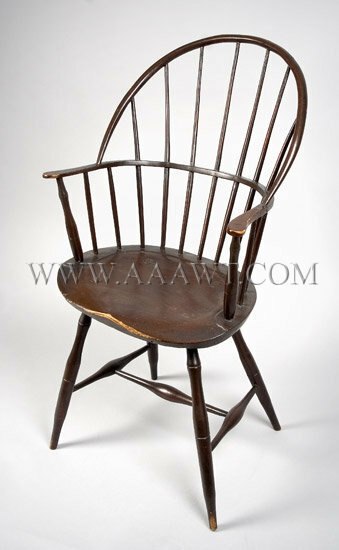 See American Windsor Chairs by Nancy Goyne Evans, pages 468-469, 471. 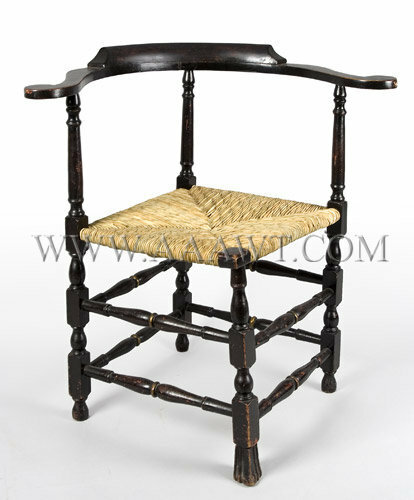 The carved pillow-crest on very stylish flat arms having out-swept scrolled-handholds raised on tapering turned posts above the seat; below the seat the block and baluster posts are joined by robustly turned double box stretchers. 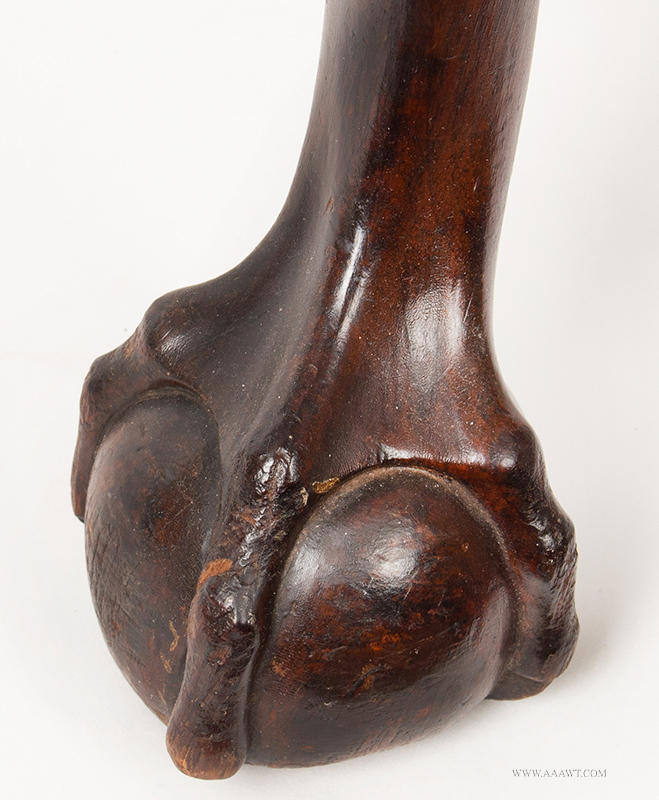 The front leg is raised on a Spanish foot with others raised on elongated oval-ball feet. 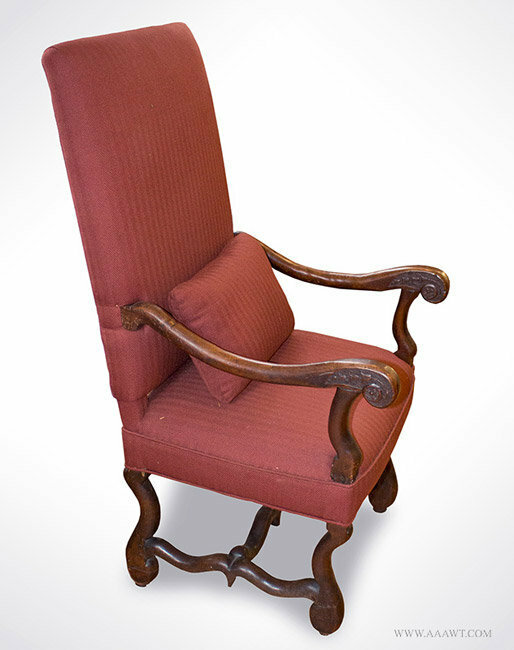 Nice old brown color over old, possibly original red; overall fine condition. 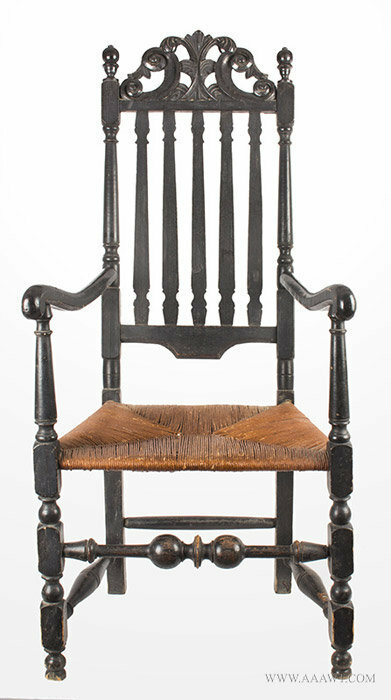 A comfortable chair featuring scrolled handholds and old black paint; the seat painted in soft yellow forward of the gutter. 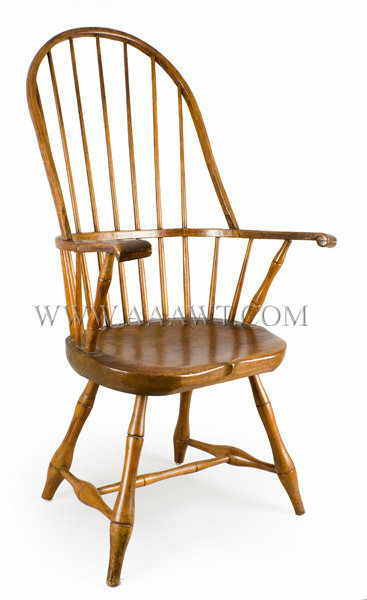 Medial stretcher appears to be an early working period replacement resultant of the chair taking a tumble. 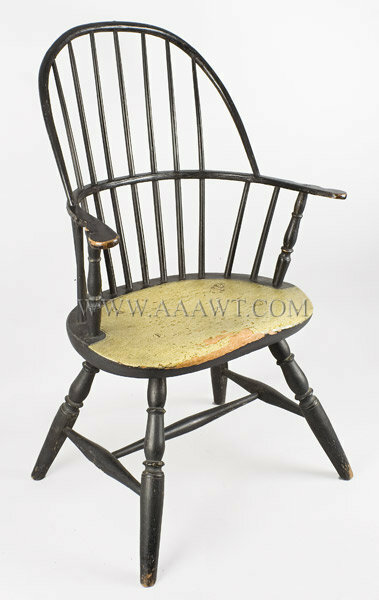 The original dark green paint now oxidized to nearly black was most likely applied as was the soft yellow paint on seat when the medial stretcher was replaced. 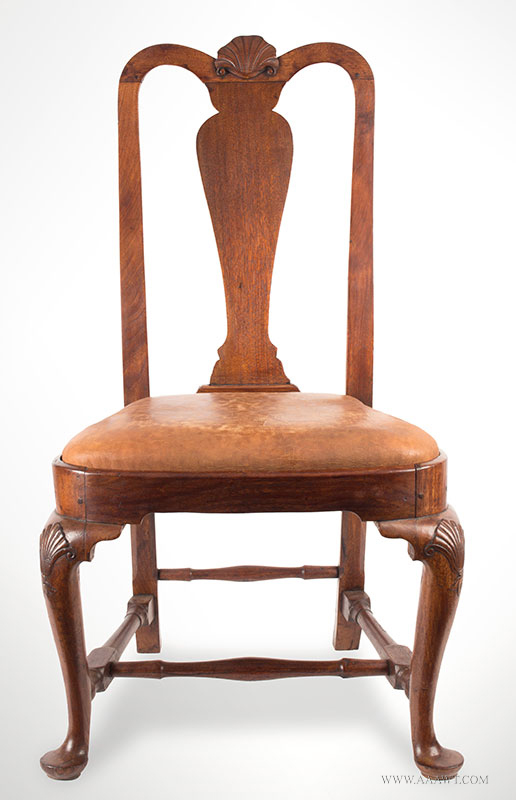 A rear leg post where joined to seat was strengthened by inserting a large dowel. 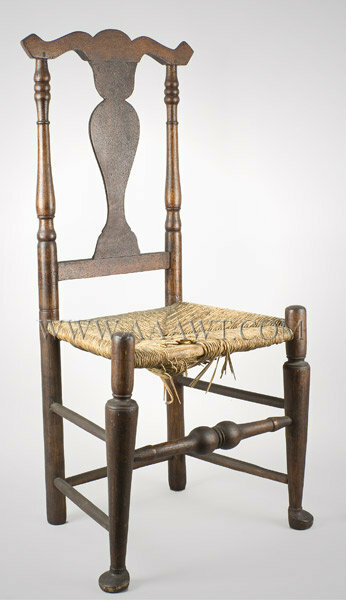 The structural integrity is without compromise; the chair should be used daily. 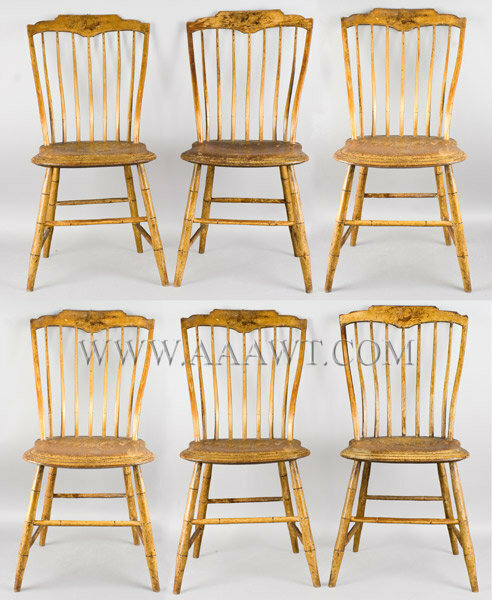 For a related Windsor chair having similar turning vocabulary, pointed feet; swell at stretcher tips, and bow channel see Nancy Goyne Evans, American Windsor Chairs, page 276, figure 6-73. 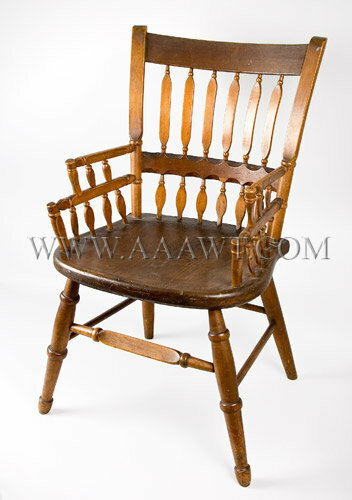 This example is in fine condition. 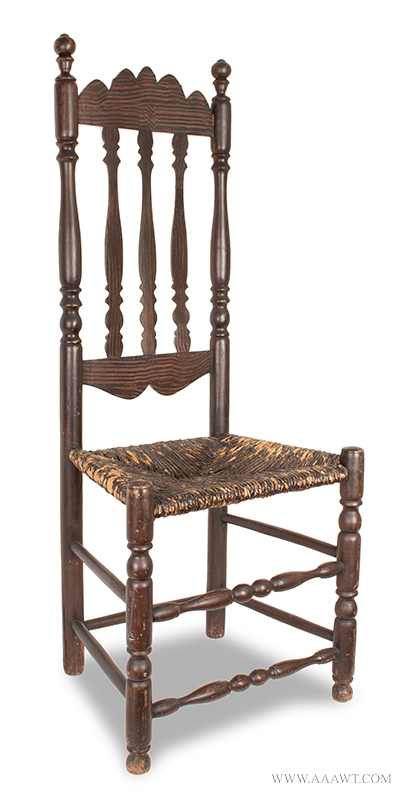 The turned rear posts featuring beautiful finials flank four graduated and arched splats forming a desirable narrow back; scrolled arms with carved handholds that may be unique rest on turned arm supports having bowl turning above baluster; the front post continuing to ball feet. 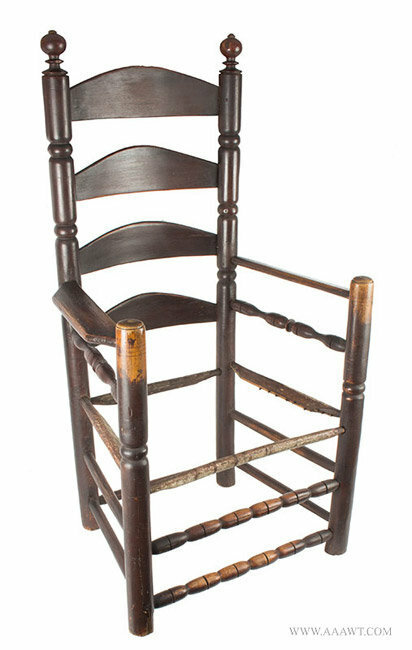 The legs are joined by stretchers. 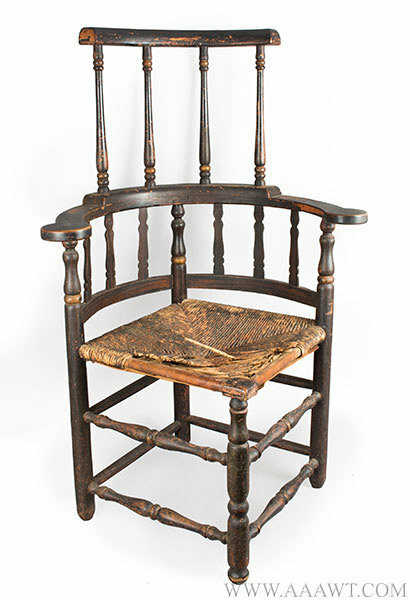 Overall thinning salmon paint; rear post branded, probably maker. 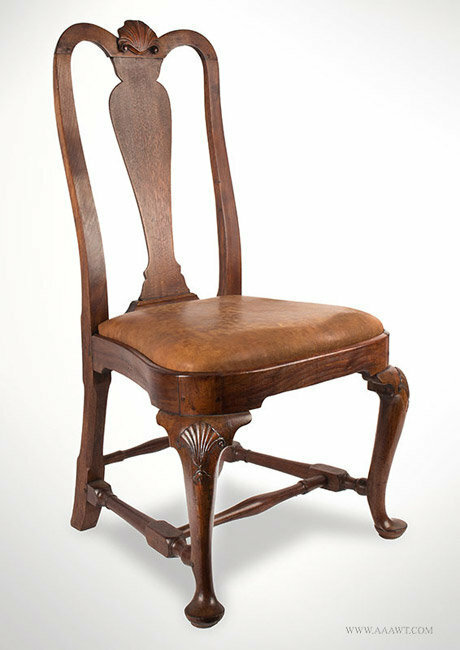 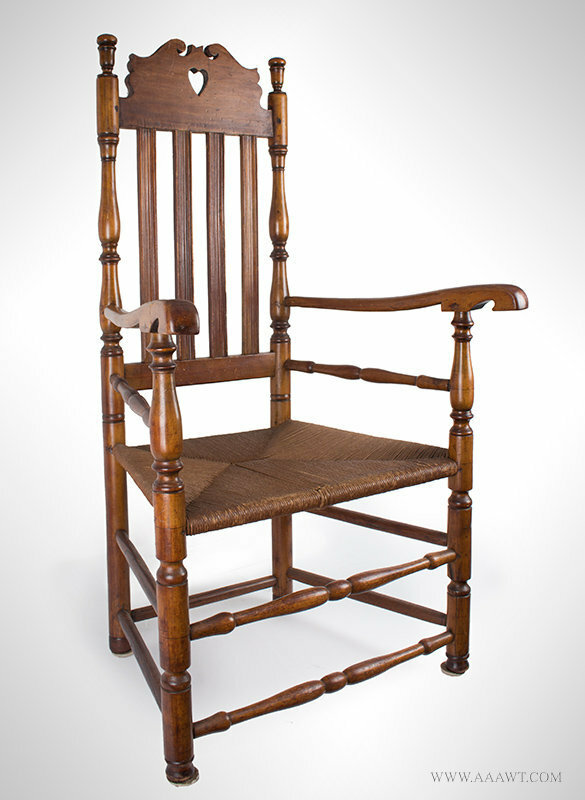 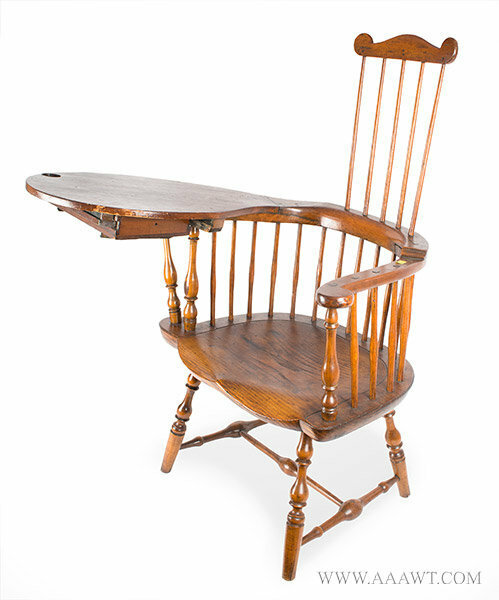 The tapering bow with low-sloping arch above arm rail with shaped handholds pierced by seven spindles; the arm is supported by turned posts; the shaped seat features a narrow chamfer conforming to bottom edge and is grooved at inside and outside edges of spindle platform. 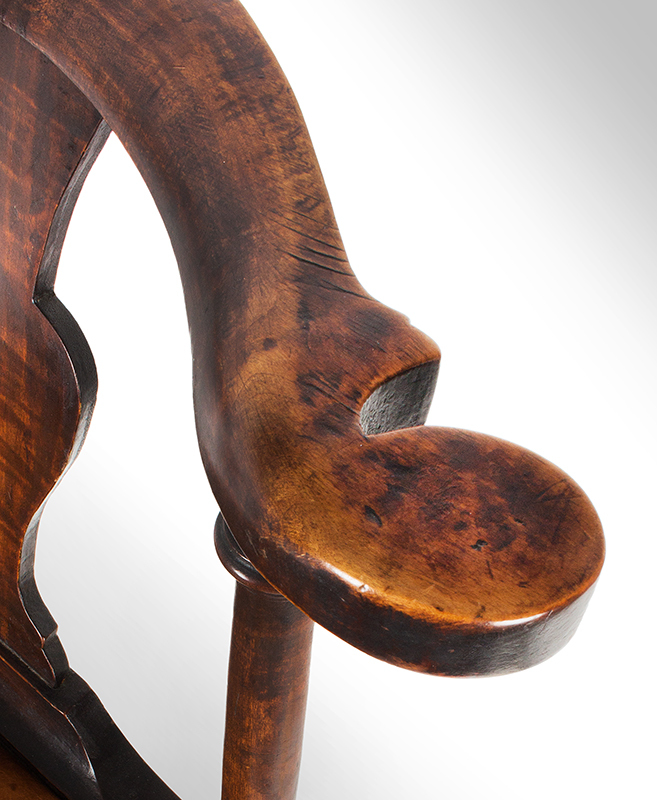 The chair is raised on uniquely turned legs with abruptly tapered foot (toes) joined by robust swelled stretchers. 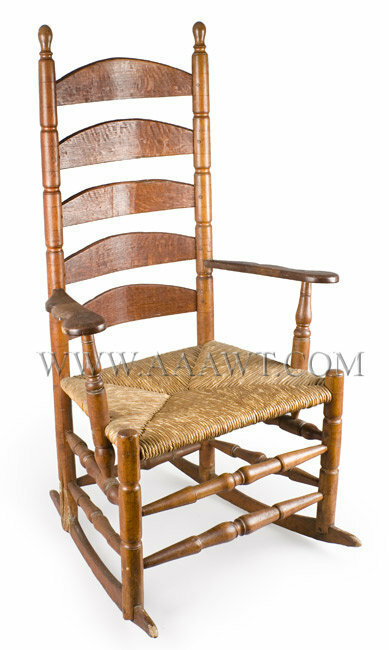 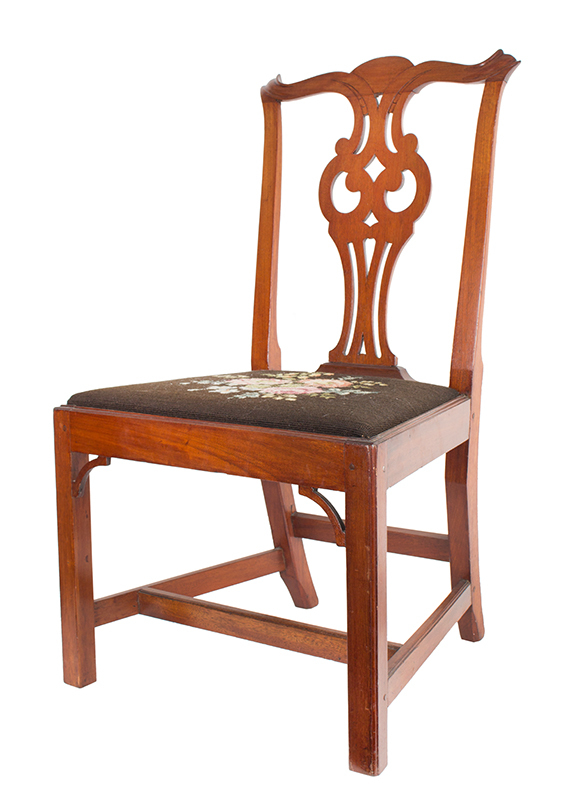 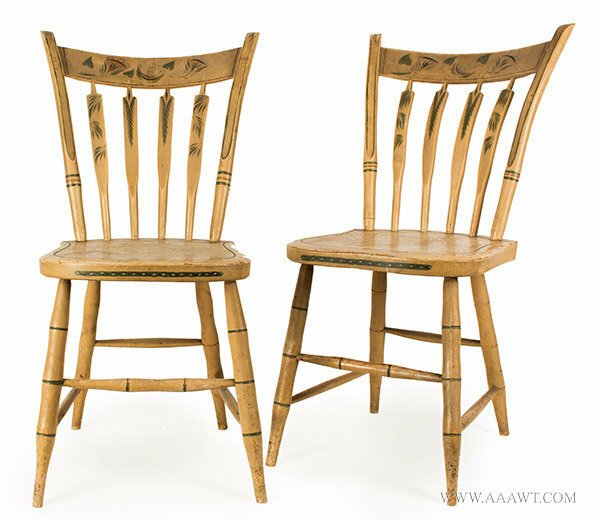 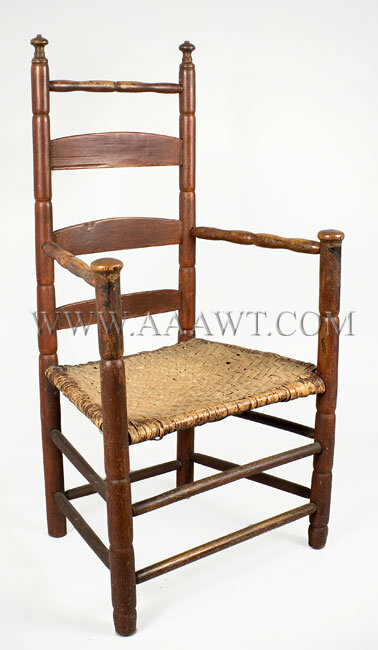 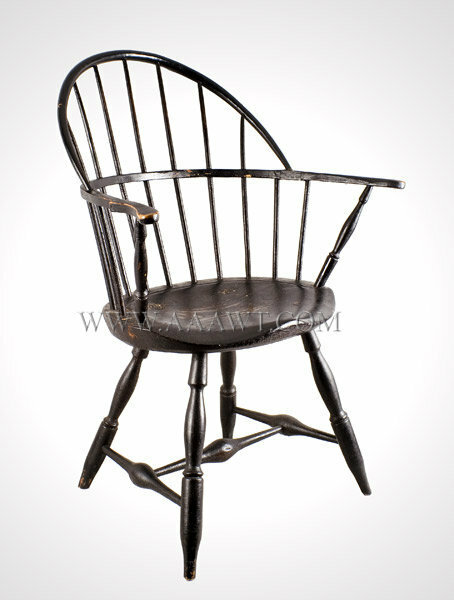 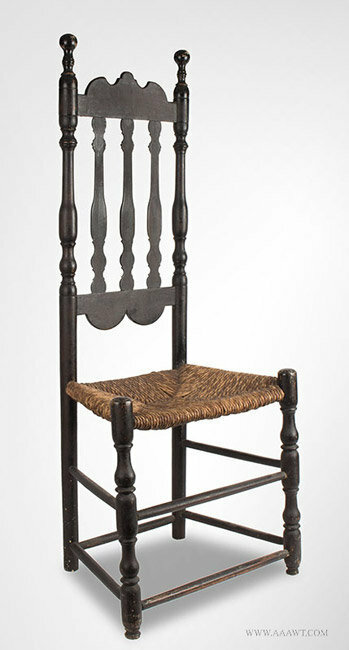 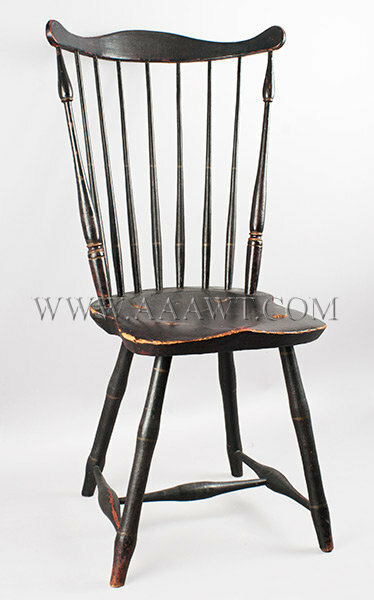 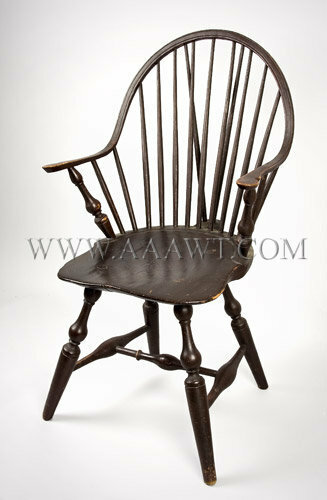 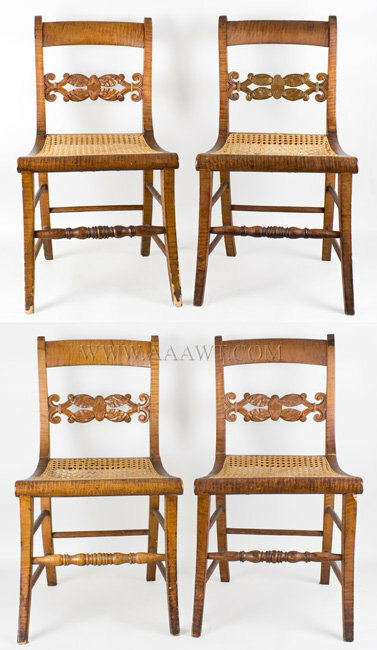 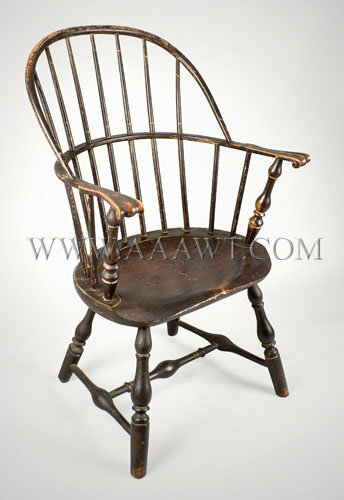 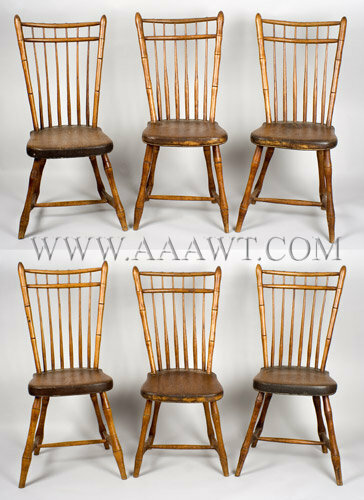 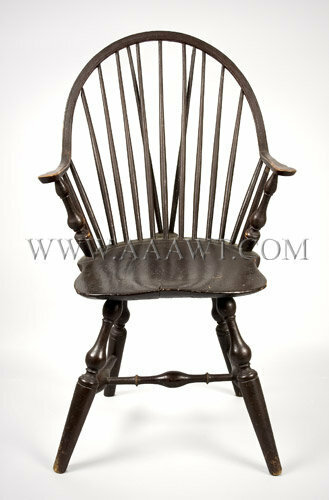 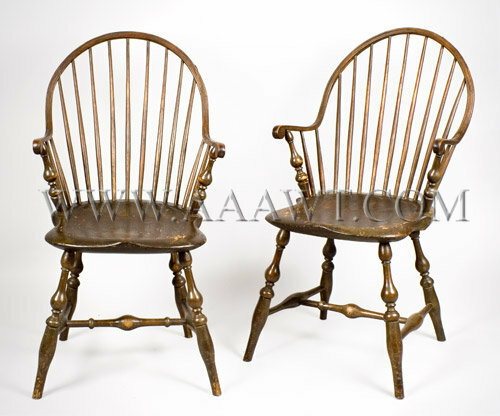 See American Windsor Chairs by Nancy Goyne Evans, page 255, figure 2-26 for identical example. 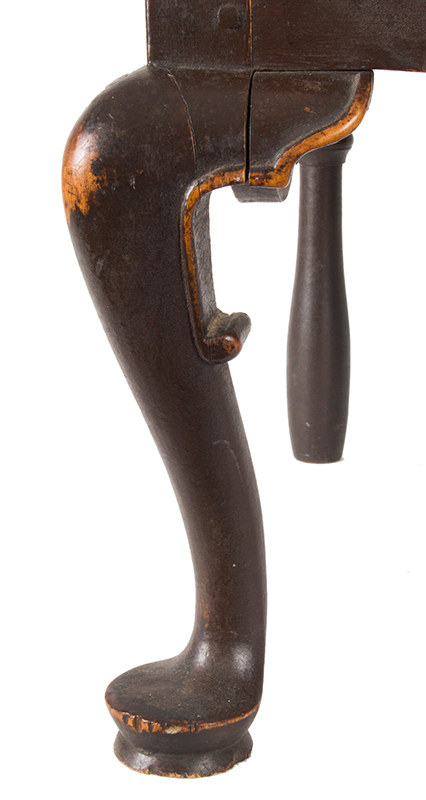 The left proper arm-rail has been pinned where bow pierces the arm to repair shrinkage fractures; the arm is stable and useable. 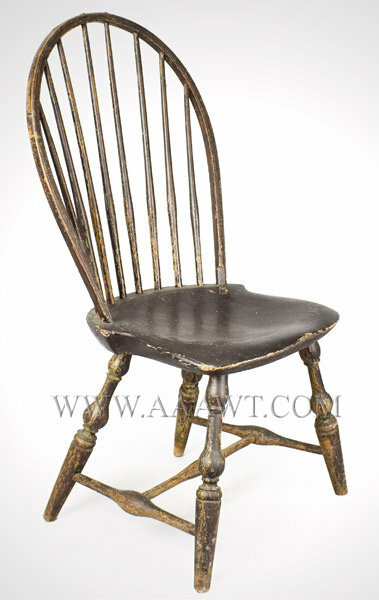 Crusty old black paint, probably 19th century. 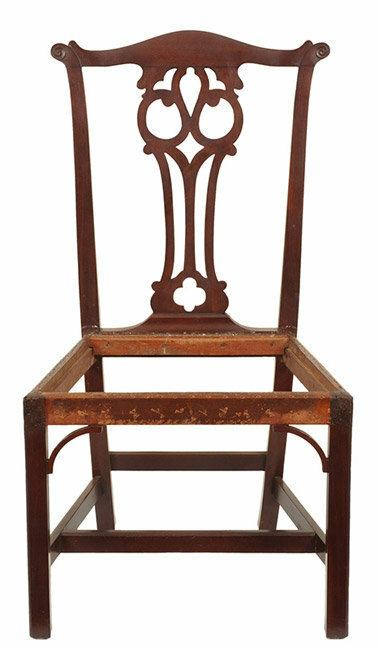 Dimensions: 35" H, 16.5" seat H, 26.25" W, 15.25" D.
A sophisticated example of generous proportion that has lost height; layers of paint have been removed exposing an old natural surface with all else fine. 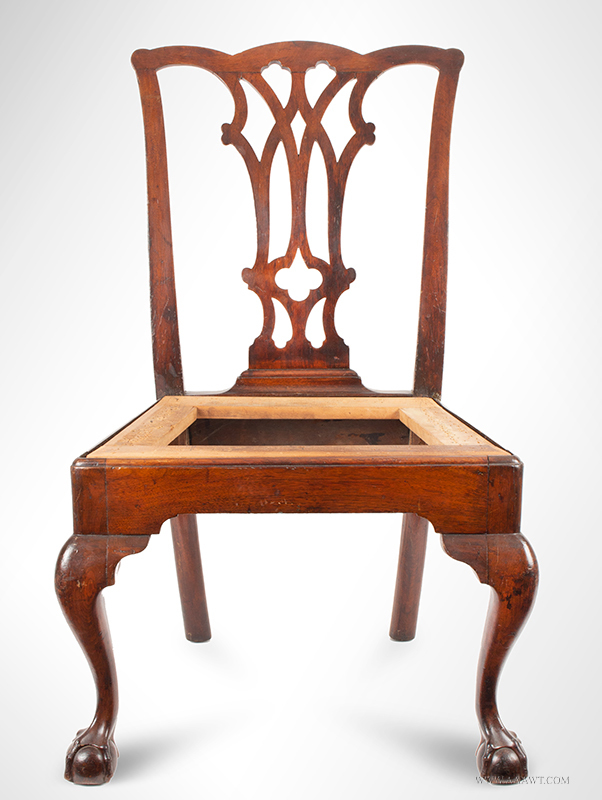 See Connecticut Furniture Seventeenth and Eighteenth Centuries, Wadsworth Athenaeum, John Kirk, 1967; page 121. 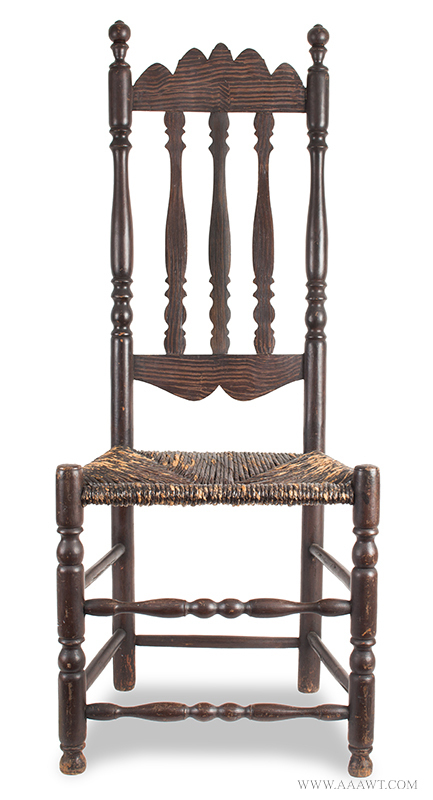 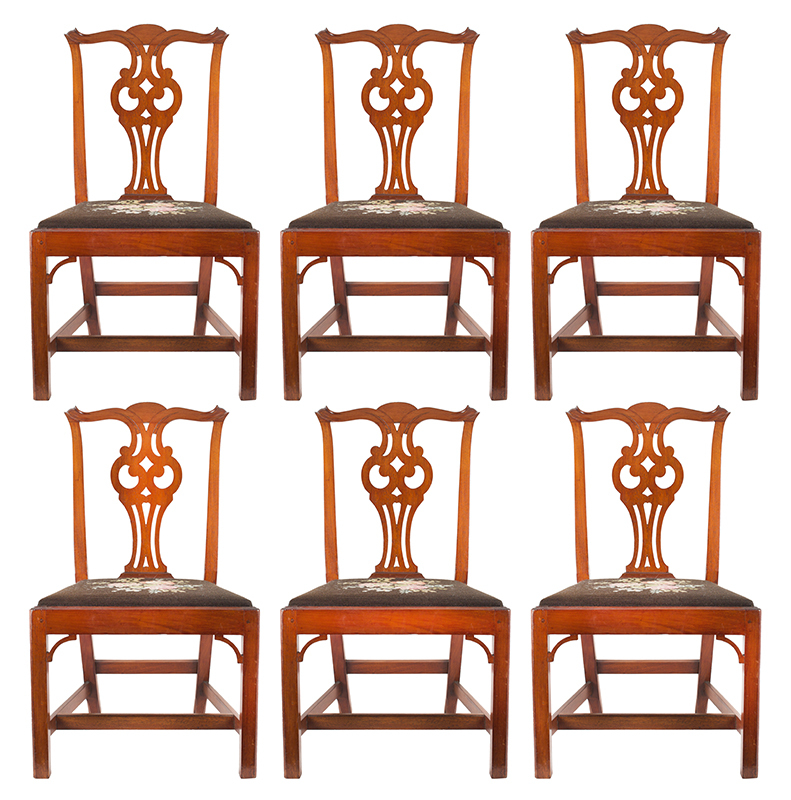 Dimensions: 49" H, 16" seat H, 24.75" W, 17.5" D.
The four arched slats centered by turned rear posts with tall exuberant finials; unusual turned arms with turned handholds rest on baluster-turned front posts. 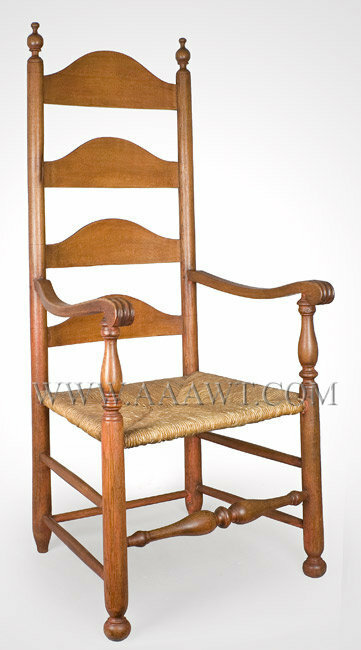 Dimensions: H: 32.5"; seat H: 15.25"; W: 14.5"; D: 14". 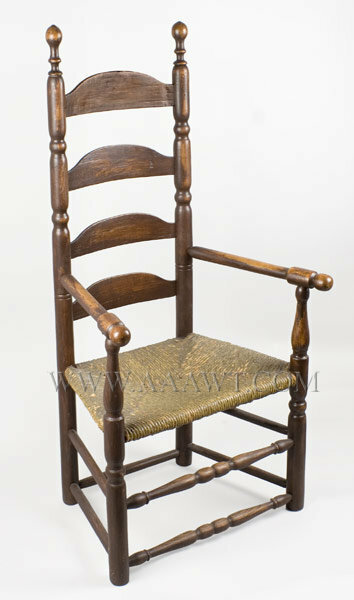 Measures 41.75" in overall height (17.25" in seat height), 19" in width and 14" in depth. 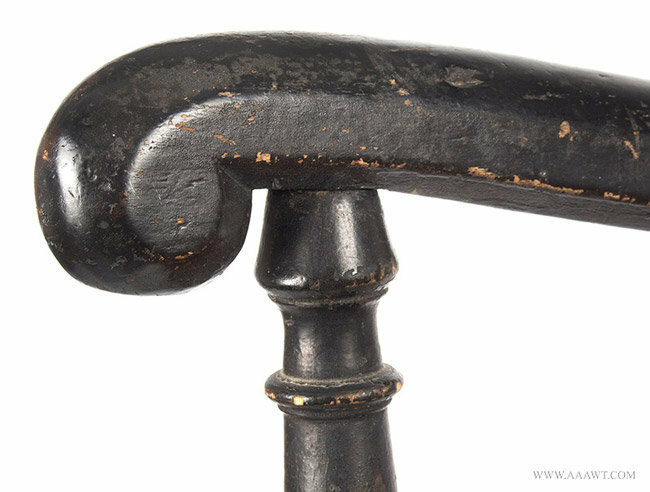 Having a gracefully curved double incised bow pierced by thirteen swelled and tapered spindles; the rails ending in scrolled arm terminals supported on robust turned arm-posts typical of Rhode Island turning. 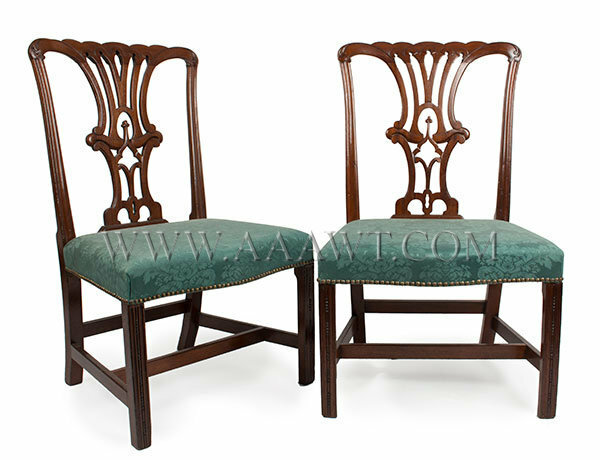 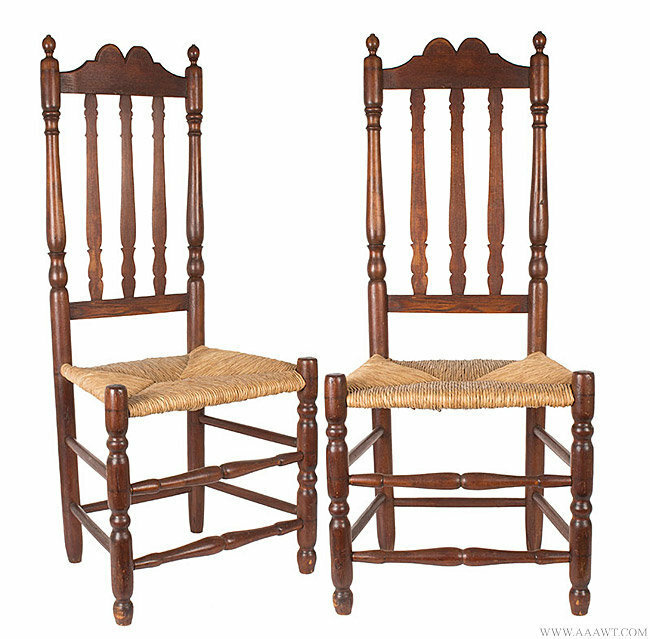 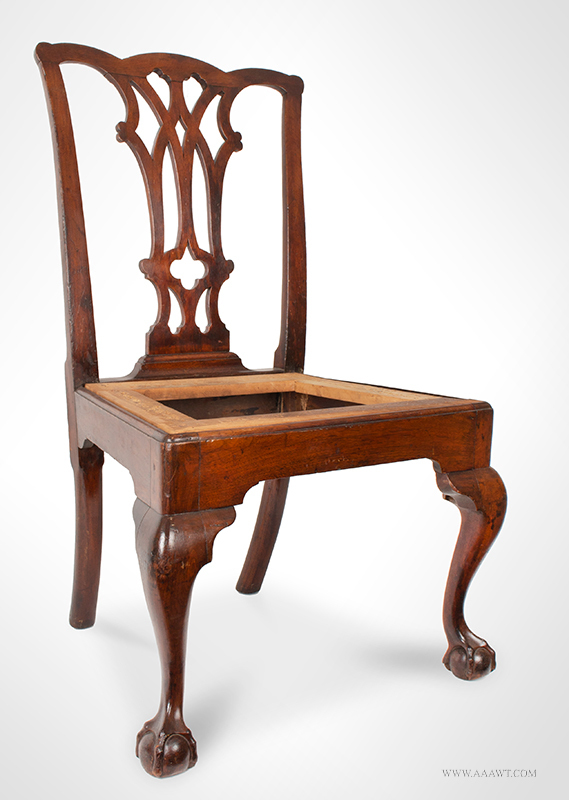 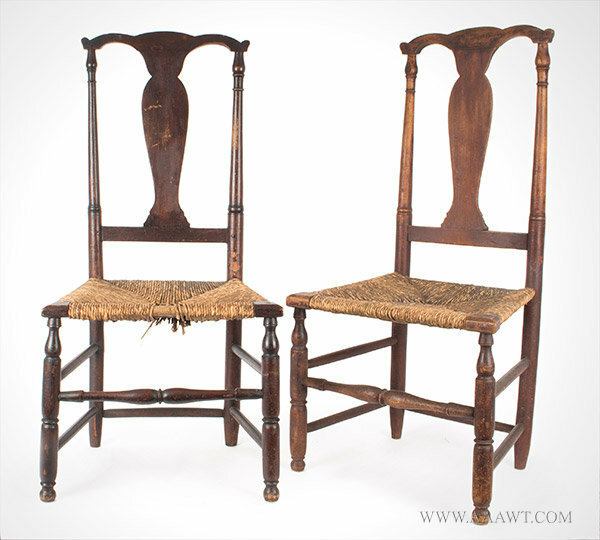 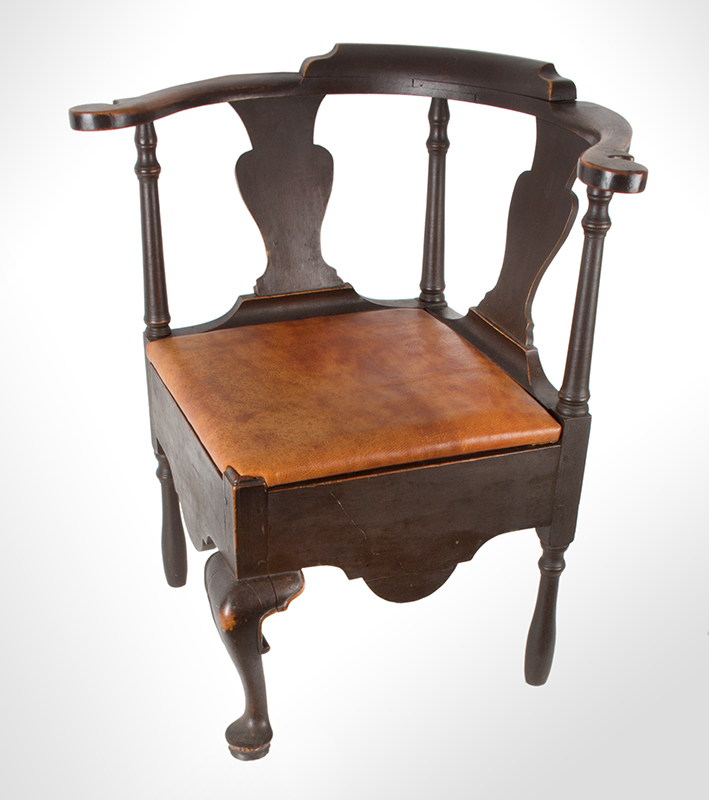 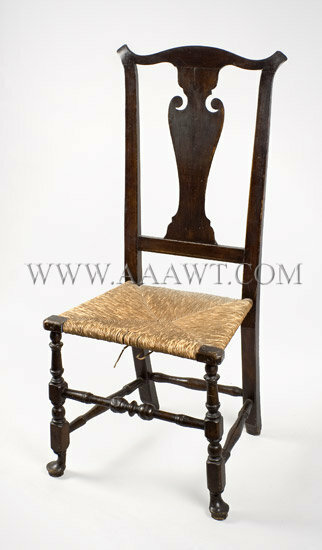 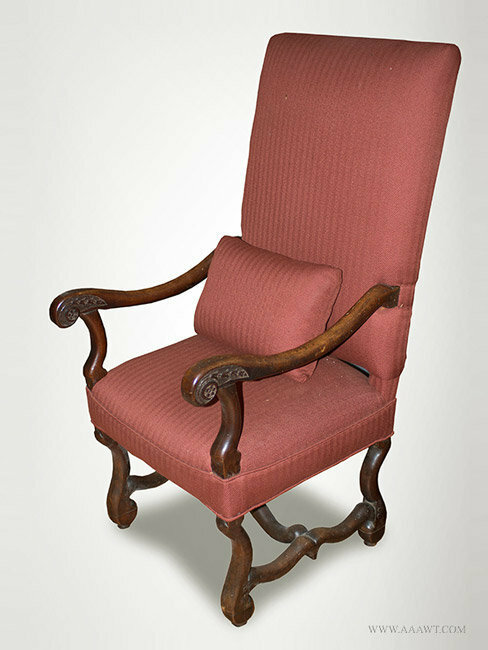 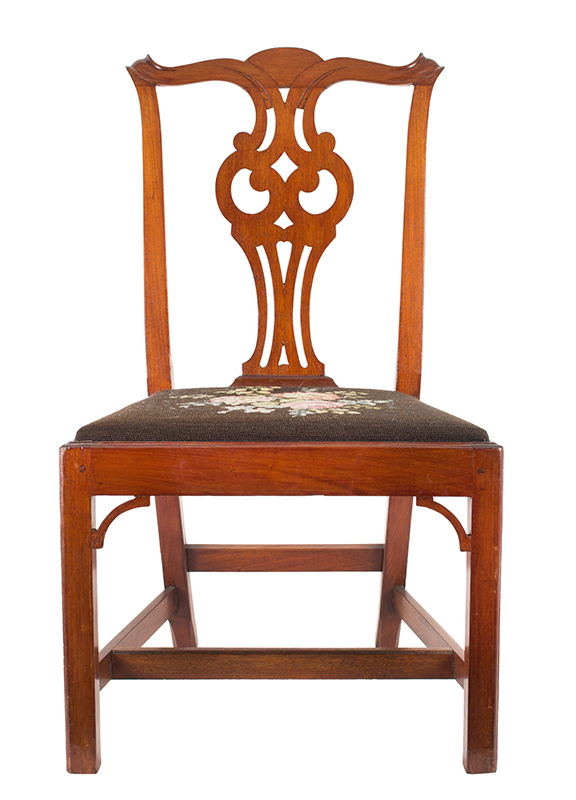 The carved seats are rounded at back, have a chamfered bottom rear edge; incised gutter centering spindles where let into seat and a front edge that is sharply undercut; the top is smartly tapered at front outside edges with pronounced pontil. 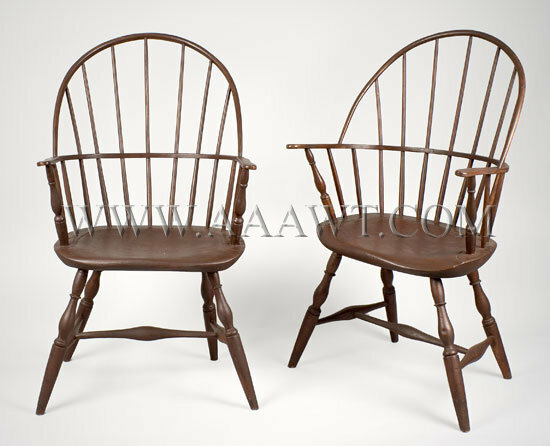 The seats are raised on perfectly splayed vigorously turned, swelled and tapered legs joined by "H" stretcher system; the swelled section centered by turned rings with collars. 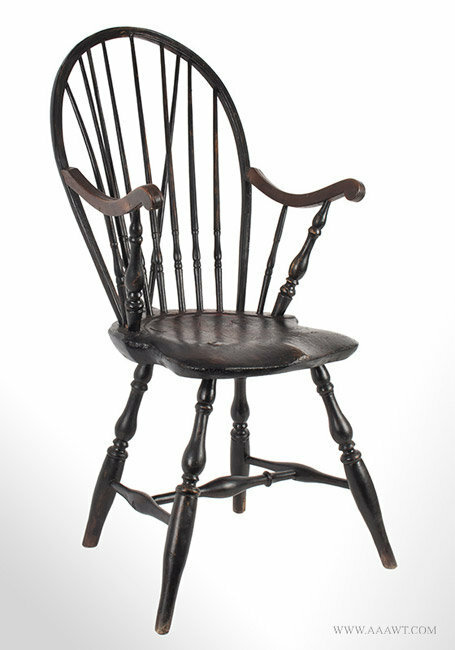 Old black over red paint, minor loss of height. 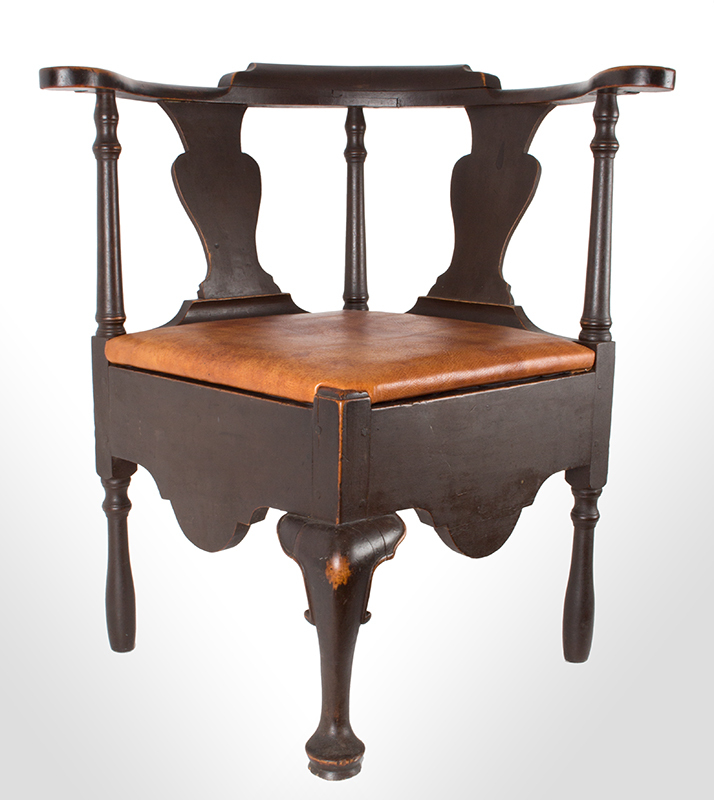 Turned rear stiles flanking vasiform splat above a splint seat (imperfections) set on turned legs with pad feet joined by stretchers. 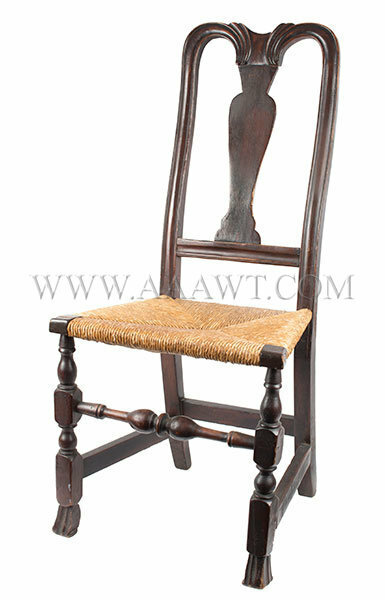 The chair remains in excellent functional condition; old crusty resin surface, nice color. 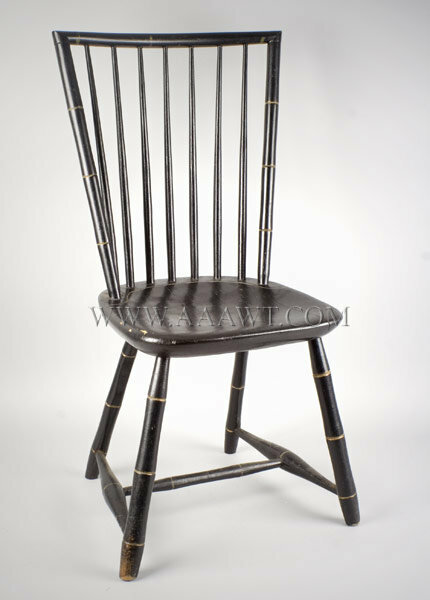 A sleek stylized chair featuring bold bamboo turnings, an extremely tall and flat crest rail, and a simple segmented rolled knuckle handhold of pegged joinery assign this chair to its own idiom. 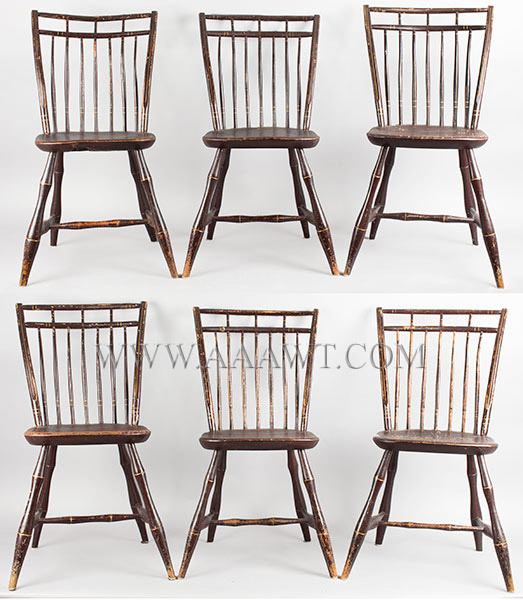 Some loss of height to rear feet, old refinish. 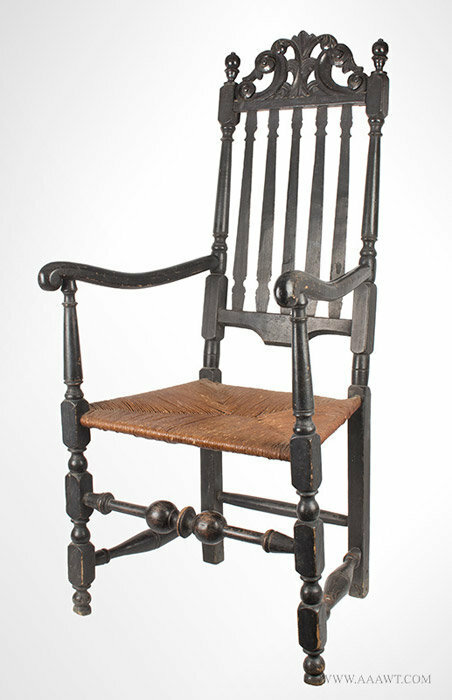 Shaped crest over four banisters and carved lower rails joined by blocked, turned and raked posts with finials; rush seat raised on block and turned front legs resting on double ball feet legs and joined by turned stretcher. 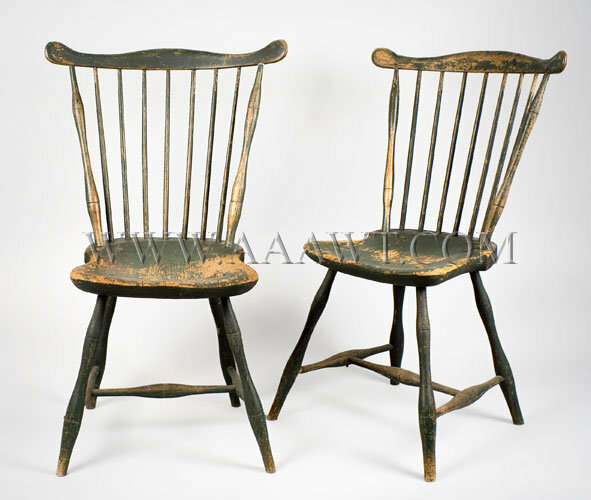 Old paint, imperfections. 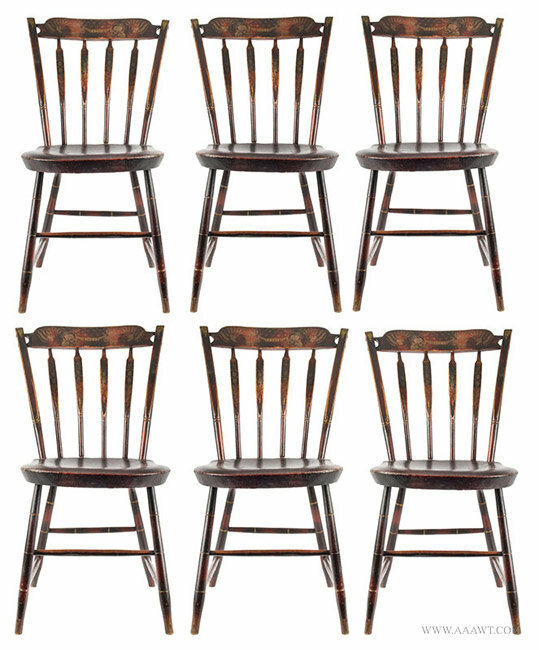 Please ask for David. 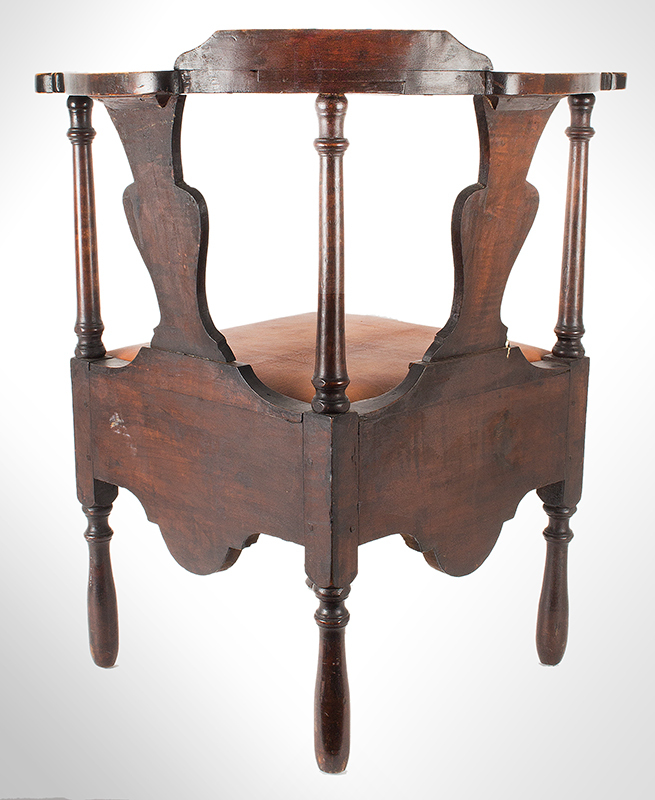 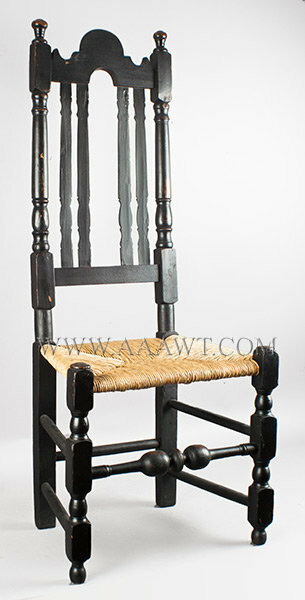 The crest rail with projecting ears on bamboo turned stiles centering seven tapered spindles; beautiful shield-shaped seat raised on similarly turned legs joined by "H" stretcher. 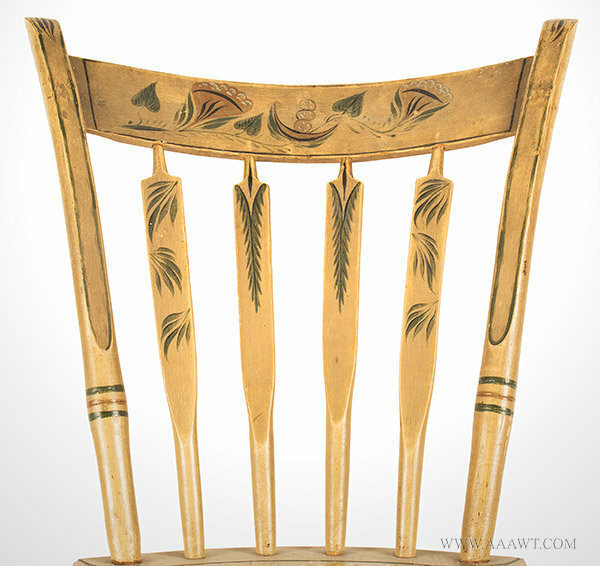 The paint is very early, as depicted there are surface losses. 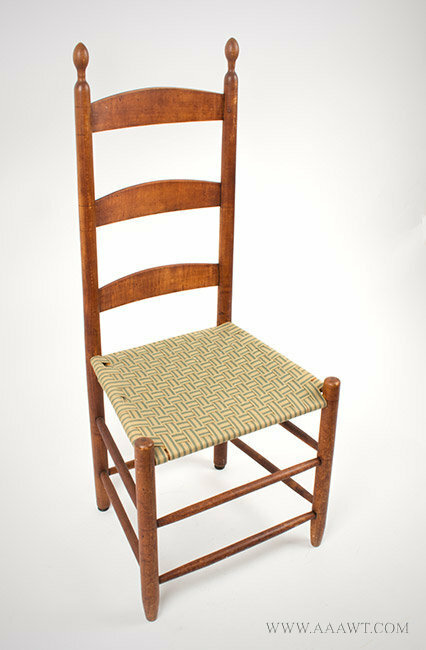 One post mended at comb, tight shrinkage fissure on back of one comb. 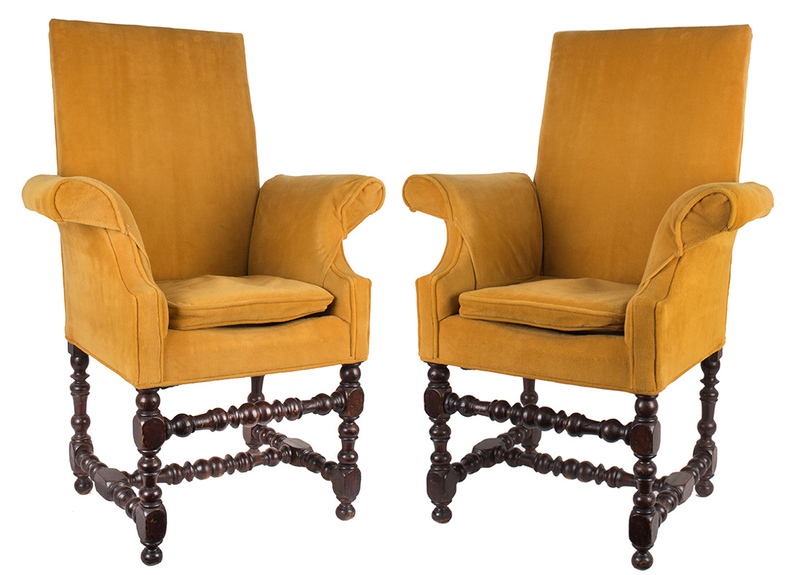 As depicted, a matched pair having generous proportions. 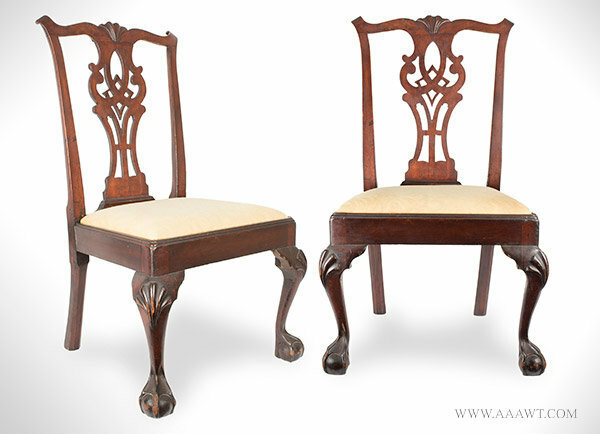 Some restorations...late red painted surface; lovely and functional. 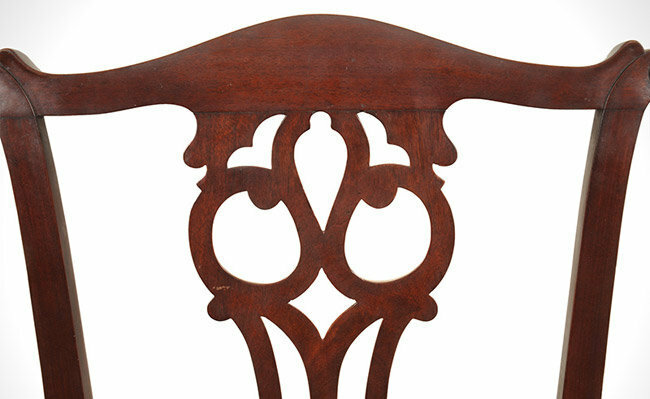 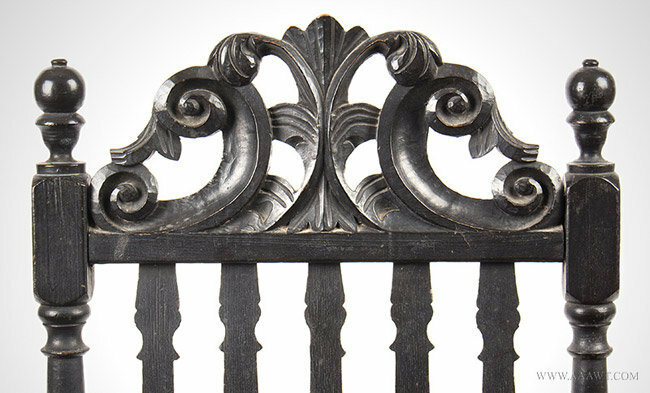 The top rail centering six flattened splats, each embellished on top and bottom with a small, turned ball...beneath which is a bottom rail with scallop carving and six similarly designed flattened spindles. 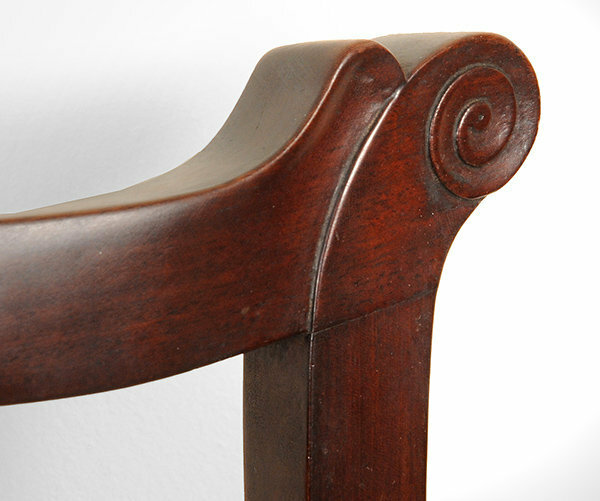 The posts with thumb-shaped finials and compressed ring turnings, receive the arms that conform stylistically to the back. 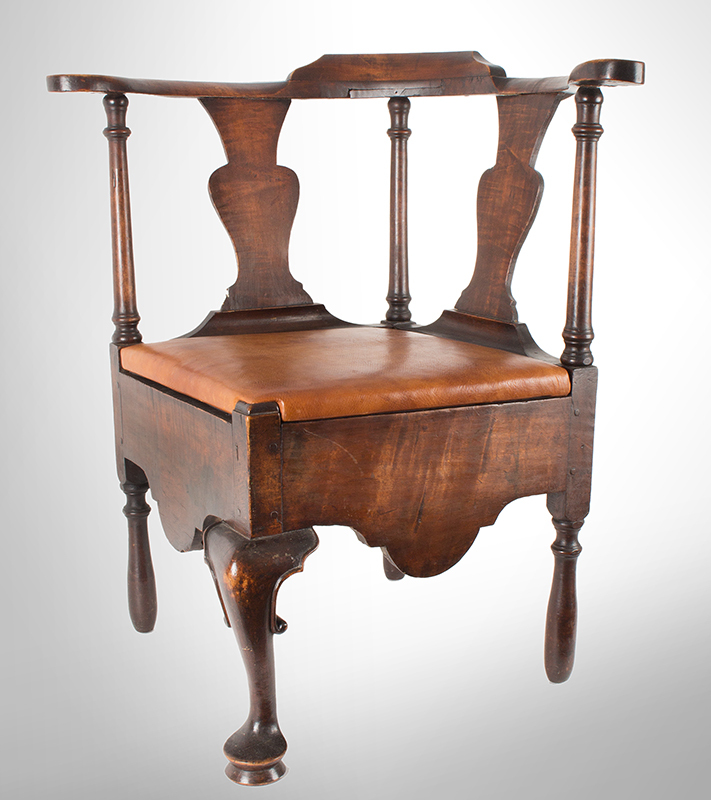 The shaped seat raised on turned legs, joined by box stretcher. 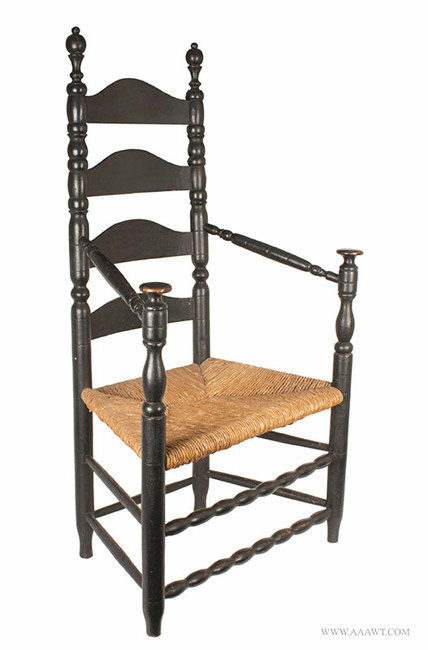 This chair wants to be Southern, however, it may be that is hails from the Midwest; regardless, a whimsical inspiration that is perhaps singular. 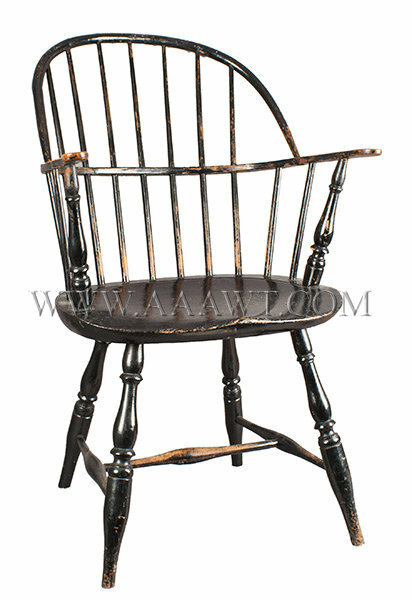 Dimensions: 35.25" high, 17.5" seat height, 19.5" wide, 17.5" deep. 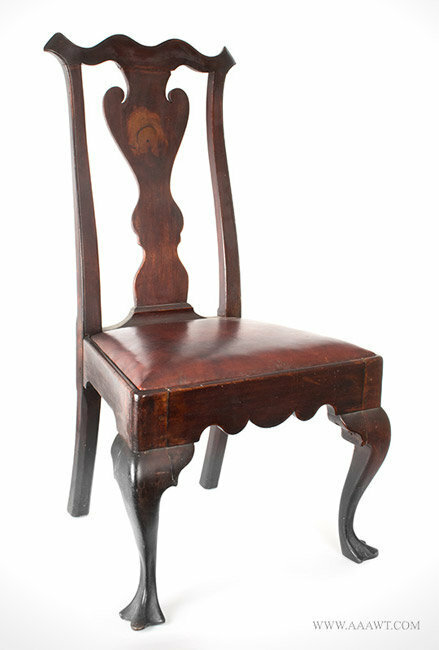 A good chair displaying overall successful form, proportions, and balance.